Indian pharmaceutical companies have traditionally witnessed substantial growth by concentrating on the generic drugs business. However, the recent past has seen a trend of Indian pharmaceutical companies climbing up the value chain and investing in research and development activities for developing new drugs. An important question which arises from a tax perspective, in such cases, is the taxability of such payments in the hands of the multinational companies in India. In a recent ruling dated 11 September 2008 in the case of Anapharm Inc., a Canadian pharmaceutical research company, the Authority for Advance Ruling (AAR) has analysed whether the fees received for undertaking clinical and bio-analytical studies is subject to tax in India. Anapharm had devised various methods/protocols for carrying out the evaluation work which are product-specific and cannot be used in evaluating other generic drugs, i.e., for each new drug a fresh evaluation would be required to be undertaken. The contention raised before the AAR was that definition of “fees for included services" under the India-Canada Double Tax Avoidance Agreement was a restricted definition, that is, only services which “make available" any technical experience, know-how or technical plan or technical design qualify as fees for included services. In that context, Anapharm had filed an affidavit, supported by two confirmatory declarations issued by the two Indian companies. The declaration from one of the Indian companies stated that one of the clauses in the agreement, which states that all data developed in the course of study shall be its sole and exclusive property, formed part of the standard format, and had not been given effect in the present case to prove that Anapharm did not reveal or pass on any experience, skill, know-how, method, procedure or protocol to them. The second Indian company in its declaration stated that Anapharm had provided a report consisting of factual analytical results of samples in tabulated form. The revenue authorities contended that Anapharm was rendering technical expertise of a very high order, which was likely to result in invention, know-how, patent or other intellectual property over which the Indian companies would have full ownership. Consequently, Anapharm was making available technology, or imparting technical knowledge, and the Indian pharmaceutical companies could use this knowledge for further research and development of drugs. Hence, the payments received by Anapharm were in the nature of “fees for included services" as defined in the India-Canada tax treaty and consequently subject to tax in India. The revenue authorities also contended that such payment made for the use of technology could also be regarded as royalty. AAR observed that the issue in this case was whether by providing its final test reports to Indian pharmaceutical companies Anapharm “made available" to them its technical knowledge, experience, know-how, etc. Given that the definition of fees for included services is similar in the India-Canada and India-US tax treaties, AAR made reference to clarification/interpretation given in the memorandum of understanding (MoU) attached with the protocol to the Indo-US tax treaty. This said that the provision of a service that may require technical input by the person providing the service does not per se mean that technical knowledge, skills, etc., are made available to the person purchasing the service. Similarly, the use of a product which embodies technology shall not per se be considered to the technology being made available. In this connection, AAR relied on the judgements in the case of Diamond Services International Ltd and the decision of the Mumbai Tribunal in the case of Raymond Ltd 86 ITD 791. Further, AAR held that Anapharm had rendered bio-analytical services which are very sophisticated in nature; however, it did not reveal to the Indian companies how it conducts those tests or the inputs that have gone into it, so as to enable them to carry out those tests themselves in future. A broad description or indication of the type of test carried out to reach this conclusion does not enable the Indian companies to derive requisite knowledge to conduct the tests or to develop the technique by themselves. AAR held that the material furnished by Anapharm would not in any way help the Indian companies facilitate further research and development of new drugs as contended by the revenue authorities. Hence, the fees received by Anapharm were to be treated as fees for included services or royalty income. Given that Anapharm was engaged in the business of providing bio-analytical services to various pharmaceutical companies, AAR observed that the fee paid by the Indian pharmaceutical companies in respect of bioequivalence tests to Anapharm were in the nature of “business profits". Consequently, under Article 7 of the India-Canada tax treaty. 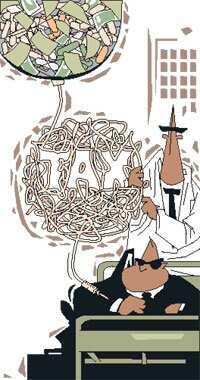 the same is not taxable in India as Anapharm does not have a “permanent establishment" in India. Though the AAR’s ruling is technically binding only on the applicant, it has a persuasive value. The ruling of the AAR in the case of Anapharm gives credence to two important aspects in international taxation. First, service fees received by foreign companies that do not “make available" technology, etc., to the recipient of the services do not qualify as fees for technical/included services under the appropriate tax treaties. Second, and perhaps more important, is that while interpreting the India-Canada tax treaty, AAR has relied on the MoU regarding the India-US tax treaty, which could become a very important aid for construction and interpretation of tax treaties.